Background Self-explanation while individually diagnosing clinical cases has proved to be an effective instructional approach for teaching clinical reasoning. 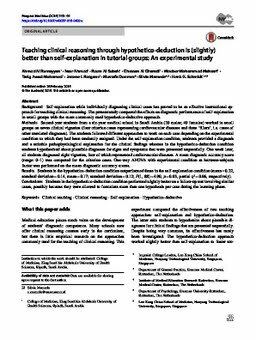 The present study compared the effects on diagnostic performance of self-explanation in small groups with the more commonly used hypothetico-deductive approach. Methods Second-year students from a six-year medical school in Saudi Arabia (39 males; 49 females) worked in small groups on seven clinical vignettes (four criterion cases representing cardiovascular diseases and three ‘fillers’, i.e. cases of other unrelated diagnoses). The students followed different approaches to work on each case depending on the experimental condition to which they had been randomly assigned. Under the self-explanation condition, students provided a diagnosis and a suitable pathophysiological explanation for the clinical findings whereas in the hypothetico-deduction condition students hypothesized about plausible diagnoses for signs and symptoms that were presented sequentially. One week later, all students diagnosed eight vignettes, four of which represented cardiovascular diseases. A mean diagnostic accuracy score (range: 0–1) was computed for the criterion cases. One-way ANOVA with experimental condition as between-subjects factor was performed on the mean diagnostic accuracy scores. Results Students in the hypothetico-deduction condition outperformed those in the self-explanation condition (mean = 0.22, standard deviation = 0.14, mean = 0.17; standard deviation = 0.12; F(1, 88) = 4.90, p = 0.03, partial η2 = 0.06, respectively). Conclusions Students in the hypothetico-deduction condition performed slightly better on a follow-up test involving similar cases, possibly because they were allowed to formulate more than one hypothesis per case during the learning phase.